Although 5 or so years ago it was barely spoken about, today microblading is such a popular treatment amongst so many, from beauty enthusiasts, those who want the freedom to put hardly any effort into their make-up, to folk who suffer from hair loss. When I first heard about it (which must have been about 5 or 6 years ago), I dithered continuously about having it done. Being in college / university limited me financially, and I was worried about having it done and being stuck with eyebrows I hated and couldn't change. I'm glad I waited a few years, as the skill associated with this area of beauty has seemed to vastly improve over time. When I took the plunge and first had my eyebrows microbladed at the start of 2016, it totally changed my life- and I cannot see any way I will ever go back! Having lived (pretty much) my entire life with trichotillomania, I've never been somebody who has had a lot of self-confidence. Having no eyelashes throughout my school years and barely-there brows through sixth form destroyed my image of myself, made me ashamed of the fact that I pull my hair out, and left me feeling ostracised from everyone I knew. I very much felt alone, and the physical baldness made me think that I was freak. In reality, nobody probably cared, but I had internalised everything that trich wanted me to feel so much that I honestly felt that there was no escape from hating myself so very deeply. I tried my best to cover up the hair loss; eyeliner, brow kits and false lashes were incredible when I discovered them and made me feel more like myself than I had ever done before. Whilst I got my eye make-up routine down to a tee and knew what suited me, learned how to apply lashes and discovered styles that were perfect for trich, I never mastered my eyebrows. I'm not saying my eye make-up was perfect (I could still faff around for up to an hour trying to fix lashes into place and falsies never 100% look like your own eyelashes anyway), but it was far better than my skills in the eyebrow department! There is no false lash alternative for brows. Unless you have an amazing artistic flair with brow pencils, they will look slightly blocky and wonky, let alone getting a good colour match! At the worst times, I was completely bald and had no idea where to even start drawing my eyebrows on from; I'd draw them too high and have to keep starting over, too thick so they looked like caterpillars, or nail one and then never be able to replicate the other. Too many hours were spent trying to draw eyebrows onto my face, and so much anxiety and stress came from doing so (which ironically made pulling my hair out worse). There were times I would get so frustrated I would just sit there crying, wondering how I would face the day if I would have to leave the house with my hair loss being obvious to the world. Microblading immediately took this stress out of my life. If you are not familiar with the treatment, microblading is a semi-permanent make-up procedure wherein individual hair strokes are essentially tattooed where the hair should be. Some of the results are incredible (especially for hair loss sufferers), and it can be such a life-changing thing to have done. When you step out of the beauty salon, you have eyebrows for the first time since you can remember. Although it is 2D, the hair strokes look so realistic- it is the best thing I've found throughout my search for make-up to cover lack of eyebrows. I've written about my experiences with microblading a few times before, and if you read this site regularly you will probably know what a fan I am of this treatment and just how much it has affected my day to day life. 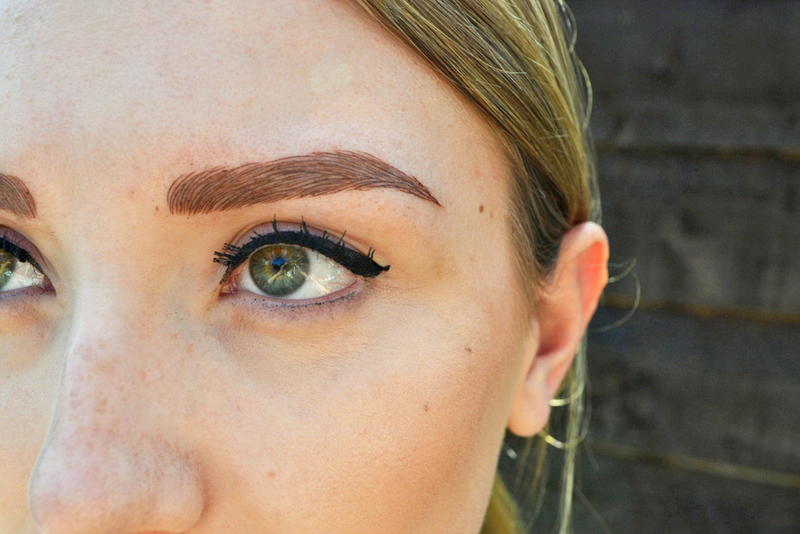 From a practical side of things, you don't have to think about having to draw your eyebrows on. That can be an extra 30 minutes in bed every morning and reduced anxiety levels. There's no more guessing where to draw them- it's done for you, with the shape perfected to suit your face. As they fade (which they will do after around 6 months), you may need to fill your brows in with powder or pencil, but it's hassle-free as you will have that shape there to guide you. You don't have to worry about things such as swimming, going to the gym, or having to be around people make-up free. It's totally liberating- both practically and emotionally. Aside from having less stress and paranoia about how I look with my badly drawn on brows, microblading has transformed my whole relationship with trichotillomania. I no longer look at myself in the mirror and hate the way I look. I always thought I looked like an alien when I saw myself eyebrow-less, and detested having to remove my make-up. It even affected my relationship (how could my boyfriend love an ugly freak like me?!). I don't see myself in that way anymore. I feel, almost...normal. I feel like me, and how I should have felt for all those years. It may seem a bit cliche and #deep, but anyone who has trich will know just how much it scars you emotionally. Microblading has almost been like a shield for me, protecting me from those more dangerously negative emotions because I don't have those constant feelings of self-loathing...because I feel normal again. And once you take those negative emotions out of the equation, your outlook on the disorder changes. It doesn't take over your life so much, you feel slightly more free. Next week will mark the third time I have my brows microbladed, this time by Samantha Trace Cosmetics in Haywards Heath, which is a little more local to where I live after previously traipsing to London. I honestly can't wait for the top-up. My brows are now 7 months old and are starting to fade more- although I don't mind having to fill them in everyday, they are starting to get to the stage where they don't look that great when I go make-up free. I want that definition and sharpness back- fresh brows and renewed confidence! It may be an expensive treatment (often costing a couple of hundred pounds), but for me, the impact it has is so profound that it is worth that price tag and ensures I will continue to have it done. It's not just a beauty treatment- for trichotillomania it is also an emotional investment. Have you ever had microblading? I'd love to hear your stories about the treatment.